Carpe Memoria: OWH WCMD Blog Hop! And you probably know what a "blog hop" is! 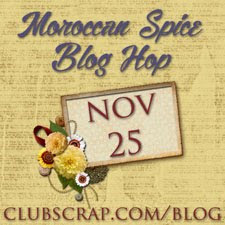 I am so excited to be part of the 2013 OWH WCMD Blog Hop--I can't wait to see the amazing creations for this year! Our task was to use an OWH sketch to create a thank you card. I chose Sketch #8. I like the two-tone background and circular focal image. And here is my completed card. All the papers are from Club Scrap's Random Doorways collection (January 2013). For the stamps, I used CS's Tribal (August 2013) circular images unmounted stamps and the greeting wood-mounted stamp from Milestones (December 2008). 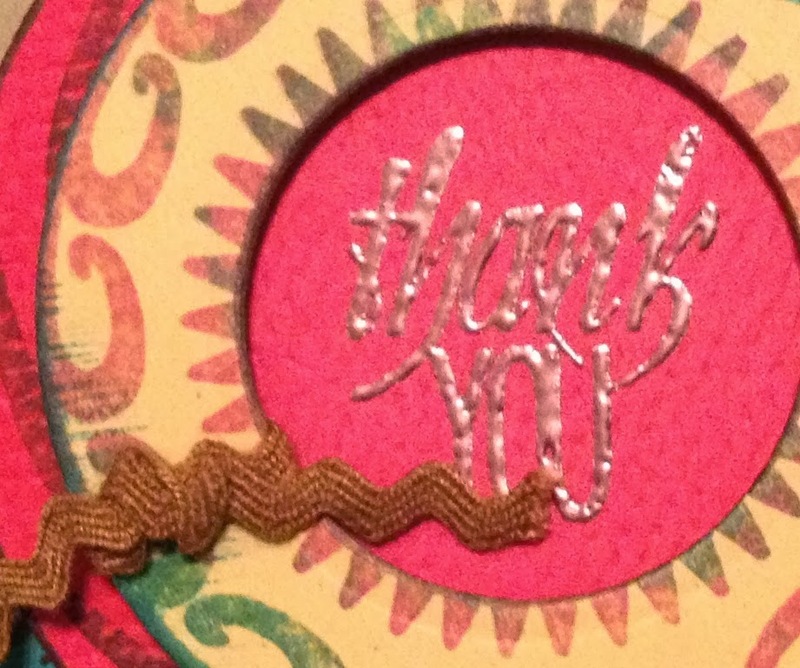 The perfect circles were cut with Spellbinders Nestabilities dies--love those things! Here's a close-up of the greeting--a bit blurry (I think my camera focused on the ric rac--also from Random Doorways). 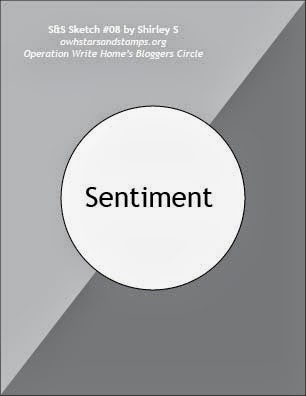 Thanks for taking a look at my blog. Enjoy the rest of the hop, and I hope you are inspired to make some cards for the troops! Fabulous Lisa! Love this card sketch choice. That is gorgeous! I had trouble with that sketch; I couldn't make those two diagonal pieces work well for me, but your stitching rocked it! Also love that shimmer! Who knew you could mix Tribal with Random Doorways? I've always found those diagonal sketches a bit challenging, but yours turned out great. A really interesting sketch and you pulled it off very well! I meant card - it is an amazing combo that really shines! Gorgeous, Lisa! I haven't ventured into the diagonal realm yet, but you made me want to try it. Great take on this sketch! Love that you sunk the sentiment - that's a cute effect! Happy WCMD! Thanks so much for sharing your take on the sketch. I've looked at it several times and can't figure out what to do with it. The stitching on the diagonal pieces really looks great. Happy WCMD! Wonderful use of so many colors! I like the layered circles. You did a great job interpreting the sketch, and the colors on your card are terrific! To me it has a Southwest feel - very nice! Fantastic card, Lisa! I love the Southwest feel, too, and warm colors. You rocked that challenging sketch! Great sketch and I like the circles. Fantastic interpretation of that sketch! I love the way you used your stamp in the circle with multiple colors to set the whole design off. Great card! Very nice - I like the cool teal color with all those warm ones! gorgeous card-and great use of the sketch! Thanks for your support of OWH and our troops! What a fun take on this sketch. 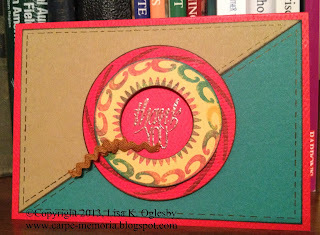 The sentiment inside the die cut window is a great focal point and the colors are so rich. Thanks for joining in the hop today and supporting OWH! Such a cool card and perfect adaptation of the sketch! Great card! Love the color combos and papers. And you did a great job w/ the sketch. Happy WCMD! What a beautiful card with all of those colors. It will make someone's day to receive it. I really like how you showcased that sentiment on this card. Thanks for the post! Love the embossing and the way it's set off by the circle. Neat card! The heat embossing really shows off your sentiment nicely! Wow! So many details that work together perfectly! The stiitching on the base is a perfect touch! tfs!!! So pretty! I love Spellbinders too! The circular stamp is an awesome touch and I really like the embossed sentiment. TFS! Beautiful!! I love the Southwest look! Your mulicolored stamping is fabulous and your sentiment really pops. Gorgeous card! I need to dig out my Random Doorways stamp and try this. Love the layers and stitching too. Thanks for your support of OWH.